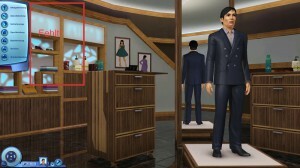 My stylist would love to do his job and style some Sims but he can’t since the list for clothing is missing. Nothing happens when I click on the buttons. This issue only occurs in non-english games. The game changes the UI to have room for the longer texts. Unfortunately the Back button got busted in the process which makes the list not appear anymore. None, really. It does work in the English version. You can change the language in the registry. MasterController fixes the issue from V105 and up. You do need to install MC Integration for the fix to work.